The 50-year-old legend was in the country to conduct a NBA Academy camp in Greater Noida and she was impressed with the talent of the young lot. 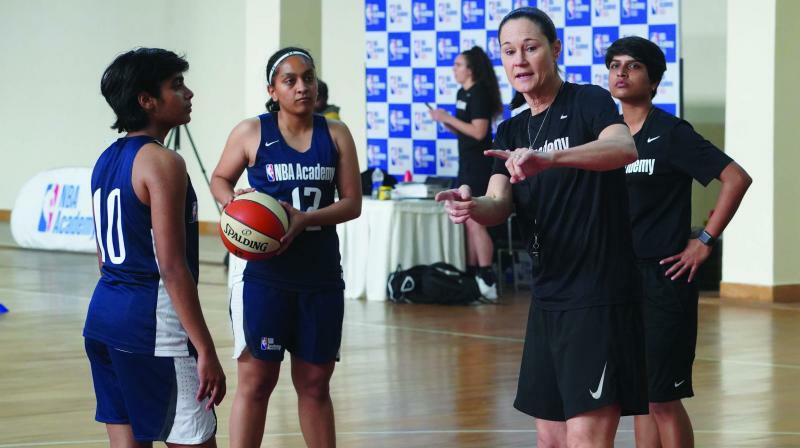 Jeniffer Azzi (left) at the NBA Academy India Women’s Camp in Greater Noida. With the popularity of basketball gaining day by day in the country, Atlanta Olympic gold medallist and women’s basketball Hall of Fame member Jennifer Azzi said with infrastucture and grassroot training in place, the sport has potential to grow in India. “Definitely, basketball can be the sport for the Indian women. Access is pretty easy, you can go up by yourself with the ball. It’s a great sport and an international sport. Everyone around the world knows basketball. India has such tremendous potential for young boys and girls to play the sport at such high level. I think what is lacking is the infrastructure at the young age,” Azzi told this paper. “So that’s one advantage that we have in US is that it is very organised at a young age and there are opportunities that are pretty clear and messages are pretty clear because we see it on television, we see it on all around us in school, and basketball is a very popular sport there,” added the head coach of the women’s team at the University of San Francisco. Azzi was even hopefull that it is not too far that an Indian player will cement her place in the WNBA. Azzi was happy the NBA Academy is nurturing young talents at their academy with their developing programmes. “Here I have send the emphasis on Education is huge. Parents here are very involved in children’s education. I think that’s very synergistic with our messaging with nba and nba academy that we want to see young people use the sport as a way to get education and there are great places around the world and US is the great place to do that,” the 1996 Olympics gold medallist said. Asked how these camps will help the players and the residential programme will give better results, the two-time world champion said, “We have had tremendous results just even in the first year, in the number of players.